Addi CLICK cords for ADDI Click, Lace Click and Bamboo CLICKS. 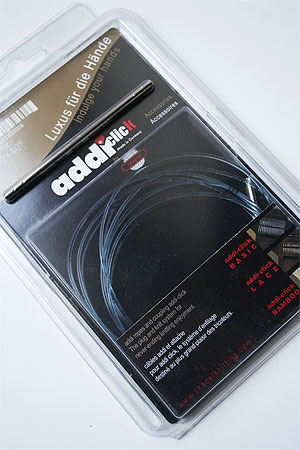 ADDI CLICK Cords in all sizes for Turbo, Lace, Long tip Lace, and Bamboo - including the new SOS/Lifeline cords. 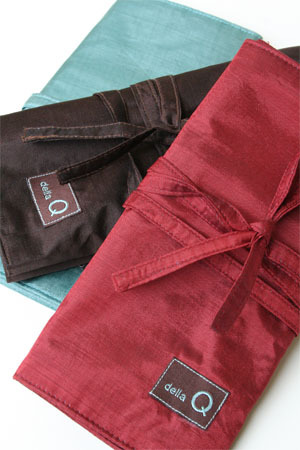 Don't forget to sign up for your elist code at the top of the page to get your extra 5% off! Any ADDI user knows, you just cannot have enough cords for the projects at hand. What do you do when you run out of cords? Watch TV? Nooooo... you make sure you have extra cords, so you can keep knitting with those ADDIS! We've added all the cords they sell - so stock up. Need more tips - yup, we have those too! There are different cord lengths and sets for the Basic or Regular Turbo Interchangeables, the Natura or Bamboo Interchangeables, and the Lace Interchangeables. We have found that all the cords fit all the sets. The multi cord length sets come with connectors - the naturas do not come with a connector, and the single cord lace do not come with a connector. You may also buy a set of connectors separately! Please note: the LONG tip lace tips don't really work with the 16" cords, they are just TOO LONG, so if you need sharp lace tips for a project that needs a 16" length, make sure you purchase a set of regular lace tips. We know it's confusing - so feel free to chat with us to discuss your options, but every ADDI cord will work with ANY of the needle sets - no matter what it's called. So order the length you need or want, regardless of what the set it is supposed to belong to! Cord Connector set is 2 connectors.